Some people build model trains. Some people play video games. Jelle Bakker, known as The Marble Master, builds super-complex Rube Goldberg machines for his tens of thousands of marbles to run through. It's good to have a hobby. 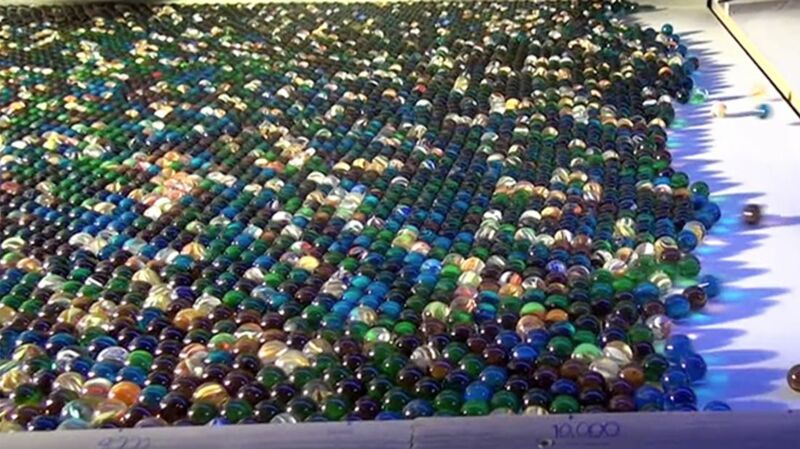 In this video, we see the Marble Tsunami, a giant contraption through which 11,000 marbles flow. As they roll along, the marbles set off chimes, hit bells and bumpers (like in a pinball game), go around loops, tip trays, and do other rather impressive mechanical things. The most incredible aspect is the sound of these things clattering; when installed, Bakker promises sound-dampening material to protect viewers' ears. (This thing is going on display this month at the Gouda Monkey Town Indoor Playground in The Netherlands.) For now, just turn down the sound. Prepare to lose your marbles. Fun fact: This kind of machine is called a "knikkerbaan," which roughly translates to "ball path."